if you ask me if i do wedding invitations my answer will be “no”. that’s my story, but i must not be sticking to it because i am always working on a wedding or two. i clearly must easily be convinced. so, i while back when i received an email from alaina about working with her on some wedding invitations i had to say yes. she had been ordering address labels from me for years and was always so sweet. she knew exactly what she wanted for her invites and sent me some sketches she had drawn out. she mailed me some fabric that i scanned in and used for the buntings on the invitation and throughout the other pieces. her mother-in-law made real bunting from the same fabric for wedding decorations. 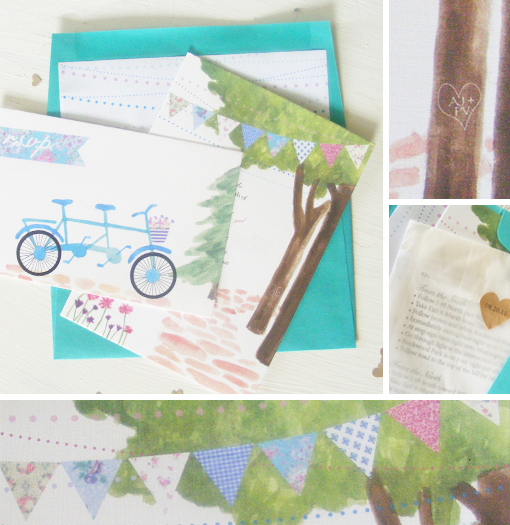 and her sister made super cute bunting/flag place cards — i love when a theme comes together. i think her wedding invitations and all the extras i worked on with her has been my favorite so far. you can see photos from her really sweet and lovely diy wedding on style me pretty here. you can see the cute little favor bags and stickers i helped out with.